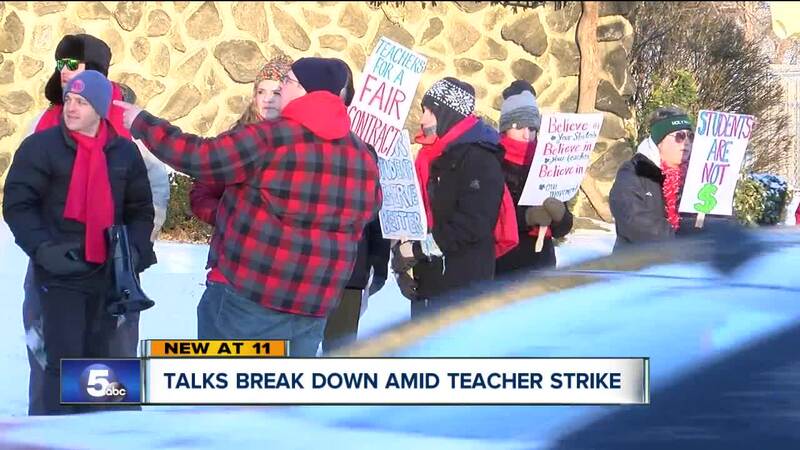 PARMA, Ohio — Instead of teaching, they've been going strong on the picket line for the past five days. "There's a lot of honking and waving, a lot of citizens stopping by who've seen our story," said Kelly Granda. Granda's been an art teacher at Summit Academy in Parma for 15 years. She's now using her basement as what she calls "strike headquarters." "Really this is just a quick break for everyone, were out in the cold for about 9 hours a day," she said. Summit Academy teachers say until their 200 kids with special needs get what they were promised, they won't back down from striking. "Our main goal is to really have a fully staffed building," said Granda. She says six positions were eliminated last school year at the charter school. "It used to be small class sizes, now I even have a class that has at one point had 22 kids in it and I'm often on my own and when 90 percent of them have an IEP and special needs, and my classroom has 20 chairs it makes it very difficult to give them the best," said Granda. And more staff isn't all they want. Granda says they also want lunch breaks, more time to plan lessons and a clean and safe school for the kids. "I love being their art teacher and I want to make a deal that gives them everything that they were promised," she said. Summit Academy Management (SAM) and union members met this morning at the offices of Federal Mediation and Conciliation Service. No agreement was reached and, at this point, SAM sees no clear path toward reconciliation with the union. "None of us are willing to go back into our classrooms if its not what our students deserve," she said.